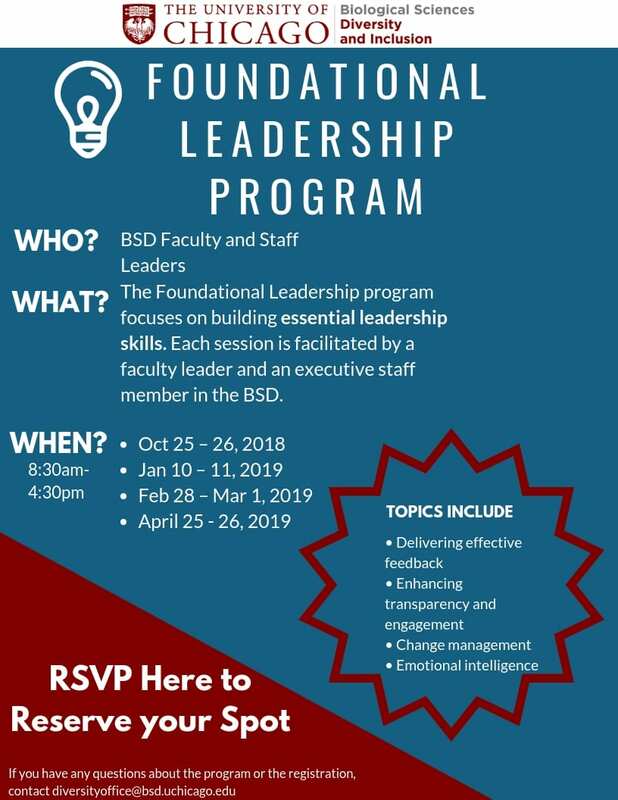 The Biological Sciences Division (BSD) Foundational Leadership program focuses on building essential leadership skills, which includes giving effective feedback, identifying the needs and expectations of stakeholders, enhancing stakeholder engagement, developing emotional intelligence and managing change. The program sets a foundation for excellence in research, teaching and patient care. 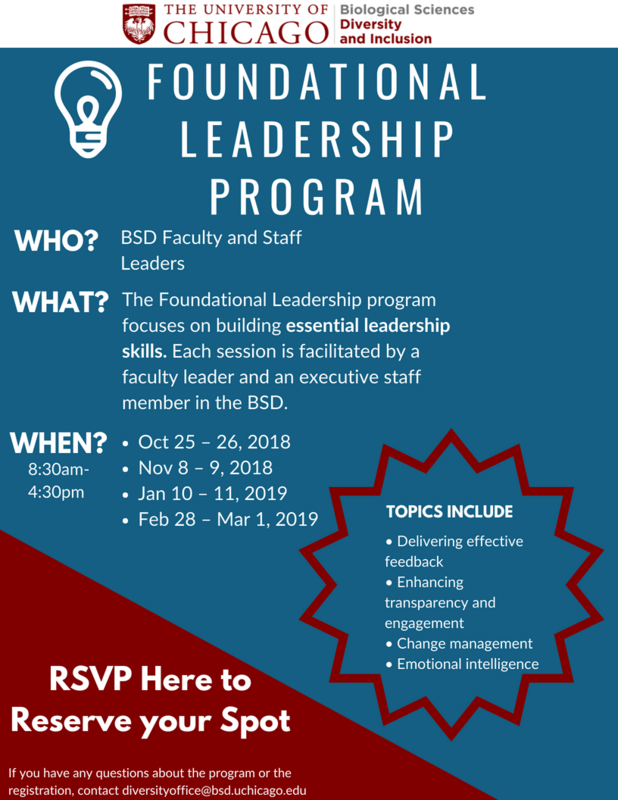 Each session is facilitated by a faculty leader and an executive staff member in the BSD. Participants must commit to 2 full days of training. This program is sponsored by the BSD Office of Diversity and Inclusion, Office of Human Resources, and Office of Faculty Affairs. Practice skills for giving effective feedback to team members to redirect, reinforce, and inspire behavior toward organizational, team, and personal goals. Articulate the needs and expectations of the stakeholders you serve, and identify ways to improve your team’s performance. Utilize the elements of opportunity and transparency to enhance engagement. Understand the principles of change management and be able to identify opportunities to propel your team forward. Faculty leaders: All BSD faculty are invited to participate including leaders of research, clinical and educational programs (e.g. chairs, section chiefs, residency, fellowship and graduate program leaders, emerging leaders and those who lead a research laboratory). BSD staff in leadership roles: Including staff in supervisory roles, executive administrators, section administrators, HR or academic affairs professionals, directors, center managers, finance managers, graduate program administrators, those who manage clinical or laboratory operations, IT managers, and emerging staff leaders. Over 200 faculty and BSD executive staff have participated since the program began in Spring 2015.